Before you are pretty sure about your poker skills and strategy, and before you want to become a World Series of Poker champion, and become one of the Top Poker Player Rankings. You must first master the basics in poker. The most important thing in this game is to understand your poker hand rankings and charts. Because you won't be able to survive far enough if you don't understand what hand card can beat the other hand. And if you understand the poker hand rankings & charts well, you can increase your poker hands odds and win easily. It needs some trick and strategy. Poker hands usually consist of five cards that is shared by the dealer. For example in the river in the hands of Texas Hold'em Poker, you really have seven cards to choose from. And you are allowed to choose which of the five poker combinations is the best card. This is even true if the two hole cards you have handled are the worst, you can 'play the board' which means your best hand consists of five shared cards. Thats why numbones.com would explain about poker rankings and charts from the strongest to the weakest. And this poker ranking will also explain poker hands what beats what. But if in terms of ties, the highest poker card wins. Royal Flush is the strongest poker hand ever. The combination of these cards consists of Ten, Jack, Queen, King, and Ace. And all must be of the same type, for example all cards are of the heart type. Then the hand with the second strongest ranking in poker is straight flush. This card combination consists of five consecutive cards of the same type. And if two players both have a straight flush, then the hand with the highest card wins. Four-of-a-kind cards are a combination of four poker cards with same rank, eg four queens. If two players both have four-of-a-kind, then players with higher four-of-a-kind win. And if they have the same card, or if they have four-of-a-kind on the board, then the player with the fifth highest card wins. Why? because poker cards always consist of five cards. A full house is a poker combination consisting of other card combinations, it is a combination of three-of-a-kind and pairs. If both of two players have a same full house combination, then one with the highest three-of-a-kind wins. If they have truly the same, the pair is counted. And so far the full house is still one of the best poker hands. What is a flush in poker? In poker, flush is a combination of five cards of the same suit. And if two players both have a flush, then one player who has the highest flush is the winner. In poker, a combination of five consecutive cards is called straight. And if both players have straight, then one with the highest card combination wins. And if you ask does a full house beat a straight? Yes, because in texas holdem rules, Full House has higher ranking than Straight. In poker, there is a ranking card that called Three-of-a-kind. Where Three-of-a-kind is a poker combination of three cards of the same rank. And if two players have the same Three-of-a-kind, the other cards, or both cards, determine the winner. Because poker cards always consist of 5 card draw. We know from the name, that Two pairs of hands of course consist of two pairs of cards. If two players both have two pairs, then the rank of the higher pair determines the winner. And if they have the same higher pair, the lower card will be counted. And if the low card is the same, then the fifth card is counted. A pair is a combination in a poker card consisting of two cards of the same rank. Because poker has a rule that winning poker cards always consist of five cards, the other three cards are called "kickers". And if there is an event where there are two players who have the same pair, then the one with the highest kicker wins. If you are not lucky enough, and you do not have one of the combinations of poker cards above, then the highest card that you have is calculated. If there are two players in the showdown who don't have a pair or better, then the player with the highest card wins. One of the core skills in texas holdem strategy is that you have to determine whether the card in your hand is strong or not. Because there are many factors that contribute to how strong or weak your poker card combination really is. And you also need to know, that the number of players helps determine the strength of your poker hand too. If many players choose to hold on and keep playing their hand cards, that means you have to assume they do it because they hold a strong hand card. But if on the contrary, if there are only two players involved in one hand, chances are the card they hold is weak. For example, a pair of aces, a pair of aces is a poker combination that is strong enough against one player, but if it is against four players, the value drops significantly. You also have to pay attention to your opponent's playing style, because that is also a big factor in your victory. If they are 'tight', then they are playing a few hands, so you can expect them to appear with strong hands when they do it. If they 'loose' means they play a lot of hands, then the relative strength of their hands usually goes down. Also note that the composition of a community poker card will determine how many potential hands are strong in the game. For example, if you hold three-of-kind, but there are four cards for flush and four cards for straight, the strength of your poker combination goes down. Sometimes this is called a 'wet' board. Vice versa, if the board consists of a sequence of cards without the possibility of flush, the strength of your hand rises. And the number of chips in the game also plays an important role. In a poker tournament, when one player has a shallow stack of chips, it is not uncommon for players to do their money with weaker ownership to avoid 'blinding'. But in the cash game, where the stack is in, you will tend to see the risk as it is taken. You have to learn a lot about this. Because to be able to understand this complicated decision requires a lot of experience. Until then, you can greatly improve your poker hand strength skills by just choosing the best starting hand poker. And of course, you must really understand poker rules too. This Starting Poker Hands chart will show you which hand you have to play and how you have to play it to start. Simply print this Hands Chart, then understand it well. And you will always know what to do throughout the game. This hands chart will really help you how to deal poker well. Because each type of poker game is very varied, we have a hand chart and an initial strategy for each gametype to make it easier for you to determine your winnings. Below you will find an example of our initial poker hand chart that you can use as a guide to playing No Limit Texas Hold'em Poker. But some people might call this a poker hands cheat sheet. The most important thing to understand in order to win in poker is that you have to accept this poker hand order only as a beginner's guide to the power of poker hands. Each person can be a winner or loser, and does not rule out the possibility of feeling both, all depending on the situation. 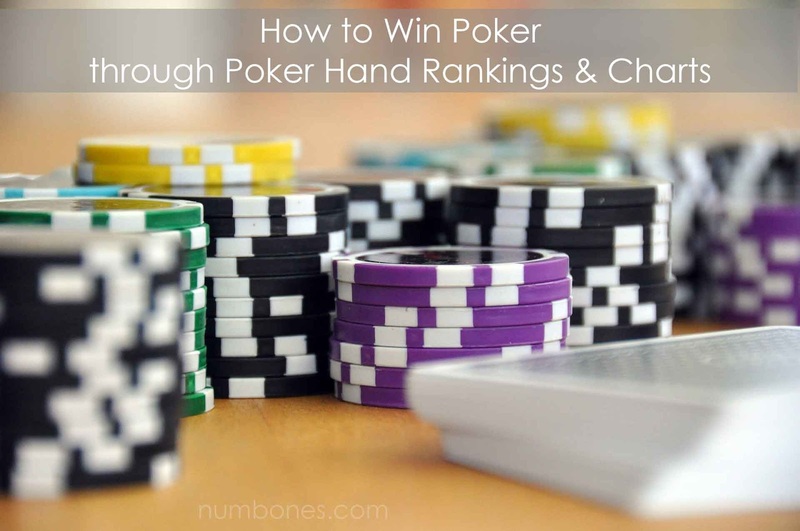 Rather than relying on this guide for sure, it is important to progress to some of the more advanced parts of our strategy once you feel you have a good understanding of hand rankings and poker charts. 2 Responses to "Secret Strategy to Win Poker through Poker Hand Charts & Rankings"